Image caption High heels lead to shorter calf muscle fibres, the study found. UK researchers say they have uncovered why women who often wear high heels can find it painful to wear flat shoes. Scans of the calf muscles in a group of frequent heel wearers found muscle fibres were, on average, 13% shorter than in those who avoided high heels. 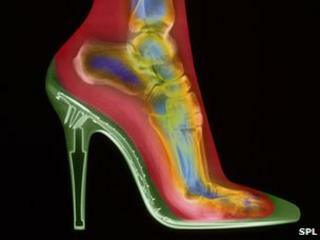 The Journal of Experimental Biology study also found high heels led to stiffer tendons in the calf. Some time spent in flatter footwear as well as stretching exercises would help to combat the effect, experts said. Anecdotally it has long been said that regularly wearing high heels shortens the calf muscle. Study leader Professor Marco Narici, from Manchester Metropolitan University, said in the 1950s secretaries who wore high heels complained that they struggled to walk flat-footed when they took their shoes off. But no-one has looked at what is actually happening in the muscle. From a group of 80 women, the team selected 11 volunteers who had regularly worn 5cm heels for two years or more and who felt uncomfortable walking flat-footed. An MRI scan showed that there was no difference in the size of the calf muscles in the heel wearers compared with a group of women who wore flat shoes. But an ultrasound scan revealed that the muscle fibres were indeed shorter in the women who wore heels. When the women were asked to lie on their front on a couch, the researchers noticed that the angle of the heel in the stiletto wearers was greater due to their shortened calf. In the final part of the study, they found that the high-heel wearers' tendons were much thicker and stiffer than in those who stuck to flat shoes. This causes discomfort when walking on flat feet because the tendon cannot stretch sufficiently, Professor Narici said. Yet he does not think women need to give up their high heels. "Fashion is intended to be uncomfortable and none of the women in the study planned to give up their high heels," he said. "We want to give practical advice and I would recommend just doing a few stretching exercises to counteract some of these changes." He said one useful tip was for high heel wearers to stand on tip toes on a step, and using a handrail for balance to lower their heels as far as they can before raising them up again. Sammy Margo, physiotherapist and spokesperson for the Chartered Society of Physiotherapy, said the study backed what they suspected. "The advice we would give is not to wear heels or flat shoes all the time but to wear a variety of heel heights to get the calf muscles working through the greatest range of movement. "But I can't say we are seeing a higher incidence of calf problems in women who wear high shoes."